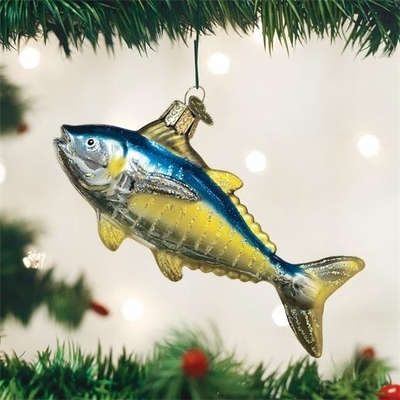 Home > Old World Christmas - Traditional Glass Christmas Ornaments > Old World Christmas Glass Ornament - "Yellowfin Tuna"
Yellowfin Tuna are found in tropical and subtropical waters and often marketed as Ahi Tuna. They can reach weights up to 400 pounds! Sport fishermen seek these fish for their speed and strength when fought on rod and reel. Anglers often describe the fish as the fastest and strongest of all tuna.